IHG® Rewards Club - eBooks - M.O.R.E. What is keeping you from turning it up a notch and embracing your incredible life? You may have achieved much, but still feel dissatisfied and disconnected. You may be unsure or curious about the next steps in your personal journey. With clarity, honesty, and humour, author Alyson Jones lends her expertise to provide a common sense wakeup call that will help you find MORE in your life. The MORE Ph… ilosophy is a life strategy that is accessible, doable and, above all else, practical. 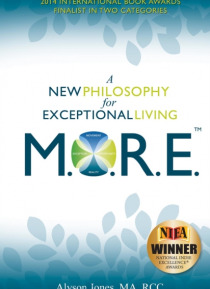 Using the steps of the MORE philosophy, this book will lead you on a path that digs deeper into your life. Start moving, recognize opportunities, face reality dare to be different and to live an exceptional life! Coleção: Alyson Jones & Associates Inc.